Known as a “gile” or “jile,” and specifically associated with Djibouti. See Spring fig. 103 for a similar but plainer example. This example with 14” asymmetrical double edge blade said to be used for ham stringing. 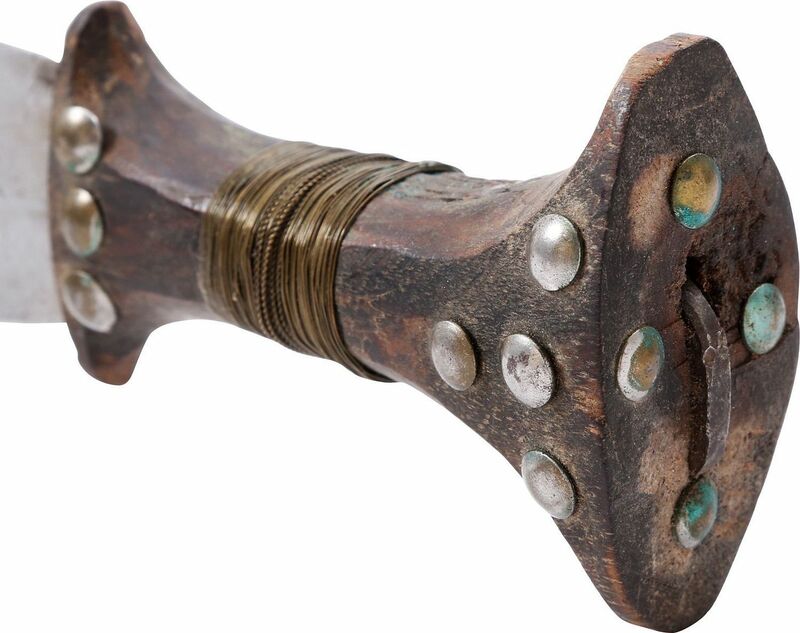 Carved wood hilt with expanded pommel and guard, the front decorated with trade tacks. Wire wrap to the middle. Original hide scabbard with engraved and gilt throat band. The tip with brass mount. Original shoulder strap with iron buckle. Natives of Djibouti, in particular the Dankil, and adjacent Ethiopia and Somalia have been Islamic for over a thousand years, converted since the Middle Ages and distributed in sultanates. They were fierce warriors who kept and traded in slaves. The Dankil considered the bow and arrow to be lowly weapons and would not use them in war, but kept a regiment of 100 archers who were slaves. Complete and well preserved throughout. The blade with original tool finish. The scabbard shrunk from age and very tight, needing care when removing the sword.